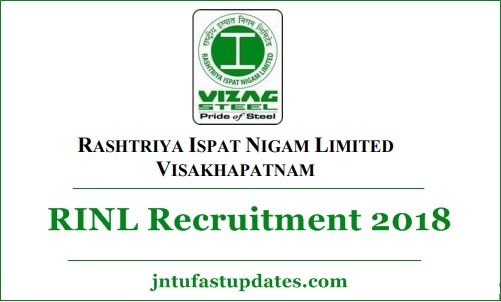 Vizag Steel JT Recruitment 2018: RINL has released 664 Junior Trainees Recruitment Notification at vizagsteel.com. For detailed advertisement including required qualifications, age limit, emoluments, mode of selection and other terms and conditions. Note: Relaxation of 5 Years in upper age for domiciled in J&K State between 1.1.1980 & 31.12.1989 will be given. Matric / SSC with full time ITI / Diploma in Engineering in the following Trades/ Disciplines (60% marks in regular ITI / Diploma in Engineering for Gen/OBC-NCL candidates, 50% marks for SC/ST/PWD candidates in all subjects of all semesters / years). Please go through the Detailed Notification at our website (Rectt Advt No. 06/2018): https://www.vizagsteel.com/index.asp. The candidate must satisfy themselves regarding their eligibility for this test before applying for the post. Examination to the provisionally selected candidates. Processing fee of 300/- (Plus GST @18%) for General & OBC candidates. The Fee shall be remitted through payment gateway by using Debit Card/ Credit Card/ Net Banking. To avoid last minute rush, candidates are advised to apply well in advance. No processing fee for SC/ST/PwD Candidates. Eligible and interested candidates only need to apply. Candidates should apply only through Online registration from RINL’s website www.vizagsteel.com under the link “Careers”. No other means/mode of application shall be accepted. STEP 2: Click on the registration link pertaining to Junior Trainee Recruitment (Rectt Advt No. 06/2018). a) E-mail ID & Mobile Number to be valid for minimum period of next Twelve Months for receiving advices, viz. Call letters etc. c) Candidates are advised not to do the Online submission of Application through mobile phone, which may cause erroneous entry of data. b) Fill the basic registration form and note down the Registration Number. d) Upload digital photo & signature. f) Print Confirmation Page after Successful remittance of fee for those it’s applicable. g) After successful submission of application, the registration slip should be downloaded from Applicant dashboard.